In 2012, I began a collection of essays about romantic disappointment, mirroring Johann Sebastian Bach’s 1751 posthumous work, The Art of Fugue. In Bach’s masterwork, a single musical subject or melody is explored through different voices, and tonal contrast, contrapunctus, begins to emerge. “Fugue” is derived from the Latin fuga from fugere, meaning “to flee” and fugare, “to chase.” “Fugue,” like “cleave,” is an auto-antonym, or a contranym; that is, a word that also means its opposite. Human beings contain their own opposite forces within them, the potential for internal consonance or dissonance. This counterpoint of existence is what bridges fugue with the personal essay. 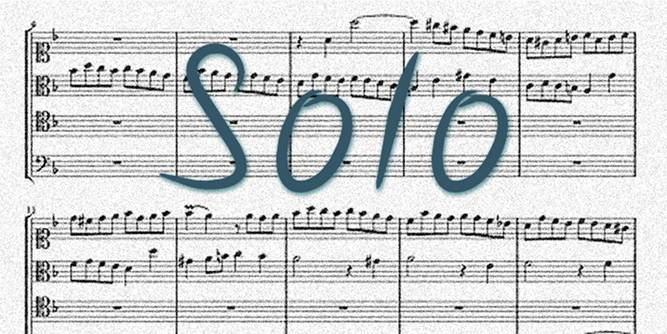 “Solo” does not resemble traditional prose, but builds on sections of 130 words to match Bach’s Contrapunctus IX which contains 130 measures. Subtitled “an open letter,” it addresses an imagined soulmate, and alludes to Charles Lamb’s bachelor fantasy “Dream Children: A Reverie” in its willingness to portray a domestic life which does not exist. You enjoy music, hiking, cooking—and you enjoyed these things before you met me. But you have never met me, or anyone like me, and I suppose that’s why we are alone. Like me, you choose comfort over style most days, and sleep late when you can. You are neat, but not fussy, and your nails are clean and trimmed. When you began losing your hair, you shaved it off, or wore a hat, a bandanna . . .
Or, having a full mane, you opted for dreads, or keep it short these days, or put it up when you’re working. You enjoy working with words, wood, clay, iron, or earth. “Beautiful and functional,” you say, smiling to yourself. Form follows function. Everything you touch bends toward beauty and truth. But you are frequently alone now, and talking only to yourself when you admire your work. You don’t drink much anymore (not that you ever enjoyed being drunk) and home is where you are most evenings. Your friends are increasingly involved in their marriages, or with their children, and let’s face it—you enjoy solitude better with each passing day. You explain this to your sister or brother or mother or father, but the insistence that you deserve to be happy or that you need to let go of the past becomes the point of every conversation. Or, no one asks how you’re doing anymore, because they accept your loneliness as a feature of your personality, and would be concerned if your signature calm was broken by a wayward intrusion. As if anything could ever be off course. The impossibility of being diverted. What direction does anything go but forward? You watch the geese fly at their appropriate times, and recognize those times as markers in your life. When was anything not on schedule? Somewhere there is someone else who thinks these same thoughts. A fatalist or a stoic. You turn back to your work, grateful that you can stop and begin, stop and begin. Wayward has a nice sound. At the least, a word worth knowing the exact meaning of. You favor exactitude, and have always liked knowing the meanings of things, their histories. If I were there, I’d look the word up. We would both take a break from our work and have a cup of tea. our labor that day had been the right and only way, and any other, this brief digression, made us victims of a rebellious, errant urge. life maps out for us. one lives is the map itself? But this is a solo, and you are not here with me and there is no hot tea or reason to be pulled from anything. Every day there is only this one way to go, and I do not stop to wonder if I’ve mis-stepped. I decide that given the way everything else has gone, there is only this road and no other. I can’t wonder if I shouldn’t have gone to meet him, or if I could have known in advance how it would all turn out. Mortal life brims with if onlys and muted instinct. It was all wrong, the way it felt, but I didn’t recognize the warning in my gut. And soon I was in a moment where there were no clear choices, no freedom, none. You weren’t there when I spent that year trying to understand why. That night I lay in bed with him, resolving I’d been badly used, that I’d never see him again, and I didn’t. That night reminded me of another, over a year before, with a different man, when I had felt suffocated by his ambivalence and abandoned. An already sleepless night was made more restless after, as I tried to make sense of the question. They might as well have been the same man, though I knew one for a short month, and the other a year. I hear the original subject of every complaint; it is a wedge between me and every happiness that those in love—who stay in love—enjoy. A burgeoning suspicion that I’m too quick or too slow, too far or too close, too in-between to ever get it right. One toe in, but my arm firmly out. How long until we change? You reassure, prop my heart up with a gentle word. Is it you I mistrust, or my own futile faith? You were never here when I needed you, so where are you now? Now and tomorrow and last year. You’ll not survive this critique. I tell myself that you have full lips and soft skin. You are graceful with long, artistic fingers. I almost believe in you. You delight in the smell of smooth Bourbon and Nag Champa, sweat, or fine cologne. I like resting in your arms. You burrow your face into my breasts. I loosen the knot of fear a little more each day. One day it disappears down the drain and I don’t notice. You sit gently on my toes because you know they need warming, and pass me the paper you’ve already skimmed. It’s a Saturday and you’re up early. You won’t speak your impatience but will wait politely. It’s market day and we’re out of eggs. Or, the reverse is true. I go for a walk and you’re already in the shower when I return. I slide my slacks off and join you. The morning is brisk, and the car’s defroster is slow. A deer grazes in the field by the bridge. You talk me into muffins this time; last week it was the chocolate croissant. Somehow after, the book store. Just a minute, you say. I twist my mouth because I’m composing lines in my memory, and sip my coffee. Fifteen minutes later, you return with three volumes, all first editions. I gaze at the blur of mums near the turn by the post. You chatter about Gurdjieff and I try to remember the essay I’d begun. And you do—chatter, I mean. I’m trying to think and you talk on, without realizing I’m glazing over, or somewhere else. Your monologues become predictable, and I feign listening more often. Faculty meetings help me refine my technique. Take pencil in hand and jot notes. Funny how much writing I begin when you think I’m pondering your best thoughts. When I say I need to be alone for a little while—to work, I say—you appear hurt, but let me go. If you knew how many times I sit staring at the screen, afraid to write the words I hear when you’re talking. Afraid that you’ll comb my essays looking for evidence that my mind wanders away in the night. That I’m only partly here. I’ve stopped searching for you as I’ve stopped waiting for myself, to come on time, to be anywhere worth being. I stopped asking where you were when I found new sentences to fill your absence. In the end we say nothing, in one mute voice together. Solo, I wonder how much nothing costs, and whether it comes in blue. I forget where I put all of the things I don’t need. Soon, I am just a body and then not even that, moving through the world complete. I’ve never needed you, I’ve never needed anything but silence and space. Pure space that surrounds me no matter how much I try to give it away. You might say there are intervals between us, of times spent with this or that lover, and that we fail to be more than isolate parallels. One of us is alone, the other inopportunely mated. Time stops and moves retrograde for a season. We betray or are betrayed, and roles shift. You are that lover I see across the room, but the script is wrong. Your eyes catch mine, just as someone hands you your glass. Your attention shifts, lighting on the one who laughs, gracefully sipping red wine. You belong and I don’t. I’m the puzzle piece that falls from the table’s edge. You’ll find me again in three years’ time, but I’ll be lost in the fantasy of a potential lover, too young. The affair will be short-lived. Funny—you argue that neither of us ever really transgressed enough. They were not nearly so young as we imagine them to have been. You never really suffered overly long for the lover who now brings wine to someone (not you) at another party in a distant city. In fact, they were never ours, though they appeared so. A year passes, then five more. We are older tonight than we were when we didn’t meet a decade ago. I can make up ex-lovers and near-misses unceasing; I have a full bottle of whiskey in the cabinet. Not that I ever drank to fill the void of your absence…still. I’ll sit in the café or the park, waiting for that second chance meeting. Every luncheon with friends, I’ll steal a glimpse at the other table, hoping to see you turn to face me, surprised by our accidental reunion. We’ll be familiar, but strange. You won’t recognize me, these days. I’m a woman or I’m a man—what’s the difference? I have silver hair or it’s brown, long enough for me to pull back, or it’s gone altogether. Let’s skip the histrionics; we’re quite old, and it would be beyond our powers to escape the solitudes we’ve found through time. Only remembering makes sense, and our coupling would be laughable. I am the grandparent who never remarried. It’s early (or late, depending), and you caught me in a dream. In it, you and I were lovers, then we were strangers who never became lovers, and then we were old and had forgotten that we had been lovers. When my students write their dreams into essays, they shift into the present tense, unconsciously. I am similarly lost in time, and you console me with your touch, ever the second person in the bed, ever the “you” that I feared never knowing, then forgot. It doesn’t matter that this is an illusion: your hands, your body, your lips on my face, your moans when we close the distance between our pleasures. We’ve grounded our arrivals and departures. I feel guilty sometimes for doubting you, for doubting that you exist. Still, it’s possible to run out of faces: the face I wear for you when I’m only partially paying attention, or the face that says I’m not really fine, and I need you to hold me. There’s one for all the things you’ll never know, because at some age, we stop telling our lovers everything. You’ll never get entirely inside my head. It’s good that we didn’t know each other when. There are no irrelevancies, I swear this has all been planned. Not only that, but I’ve already been here. I put the coat back into the closet, lock the door. I’m not coming to meet you. It’s all been forgotten, and I simply don’t recall. The time tangles free, undone. Desirae Matherly teaches at Tusculum College, and is the nonfiction editor for The Tusculum Review. Her most recent work appears or is forthcoming in Hotel Amerika, Fourth Genre, and After Montaigne: Contemporary Essayists Cover the Essays. Desirae earned a Ph.D. in nonfiction from Ohio University and is a former Harper Fellow at The University of Chicago.